Many years ago a drilling company was started under Titus L. Sensenig using cable tool machines. In 1973, Titus sold the business to his son, Floyd R. Sensenig. As the business started to grow, Floyd took on Ronald R. Weaver as his partner in 1976 and the business became Sensenig & Weaver Well Drilling. The company remained a partnership until the end of 2006. At that time, Floyd & Mary Sensenig formed a corporation continuing under the name Sensenig & Weaver Well Drilling Inc. At the end of 2007, Floyd passed away. Mary and their son Brian Sensenig took over running the business. Since then Mary has retired and the business is owned and operated by Brian. Today the business is operating with 5 rotary rigs, 2 pump crews, a geothermal department and a water treatment department. We specialize in water well drilling, geothermal drilling, mud drilling, irrigation well drilling, monitoring wells, larger diameter wells, well abandonments and well repairs. Our pump department specializes in providing pump sales and installation, service on pumps and pressure systems, outside hookups and pump retrieval’s and water treatment. 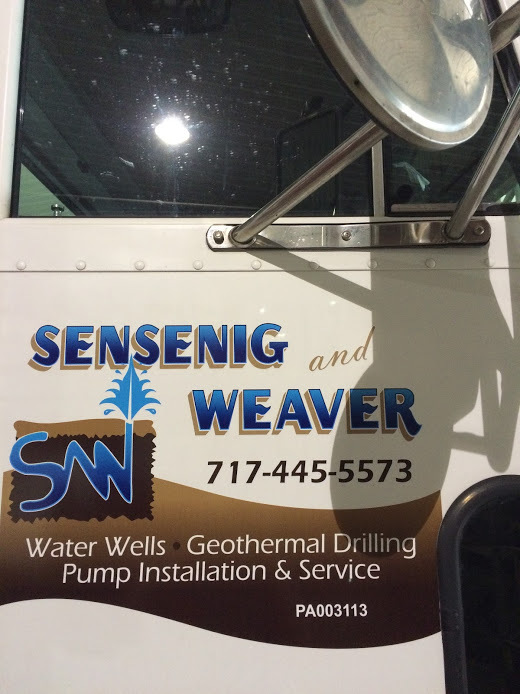 As a leader in the industry of well drilling, Sensenig & Weaver strives to provide its customers with the highest quality of work without sacrificing the superior traits of honesty and integrity. Brian Sensenig being the son of Floyd and Mary Sensenig grew up around well drilling. Brian started working as a drillers helper in June 1989 and 1991 began running a drill rig. He is a certified well driller and takes classes every year to continue his education. He is a member of NGWA, IGSPA and PGWA. His many years of working have given him extensive knowledge in troubleshooting. One of his hobbies is demonstrating his Grandfathers old cable drill rig at local events. Brian took over the business operations of Sensenig & Weaver and looks forward to continuing the family business. Fred Martin has worked for Sensenig & Weaver since September of 1991 starting out as a drillers helper. He had 15 years of experience before moving into the office to become an estimator. Using his years of drilling knowledge of local and distant Pennsylvania rock formations gives him a unique ability to estimate the cost of drilling wells in his areas in the counties of Berks, Chester, Montgomery, Schuylkill, Bucks and Delaware Counties and most points East in Pennsylvania. Fred has experience when dealing with the different Health Departments concerning permitting. When meeting our customers well needs and the ability to address their concerns about drilling a new well. Daniel Gehman has worked for Sensenig & Weaver since September of 1987, when he came to work for Floyd and Mary Sensenig as a driller’s helper. A few short months later the opportunity to become a drill rig operator led to 20 years drilling in many types or soil and rock formations. Dan says, “he never had two days the same and it was never boring.”. In February 2008 Dan moved into the office to become an estimator. Using his years of drilling knowledge of local and distant Pennsylvania rock formations gives him a unique ability to estimate the cost of drilling wells in his areas in the counties of Lancaster, York, Dauphin, Perry, Cumberland and most points west in Pennsylvania. Dan has an easy friendly personality when meeting our customers water needs and the ability to address their concerns about drilling a new well. Josh Zimmerman started working for Sensenig & Weaver in September of 2003. Hired in the pump department, he learned how to install and service different types of well pump systems. In 2008 he was given the opportunity to be manager of the pump department, where he strives to bring quality products and services to our customer.